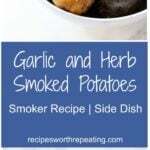 Easy smoker recipe with the simplest ingredients, these Garlic and Herb Smoked Potatoes are velvety in texture and rich in flavor! 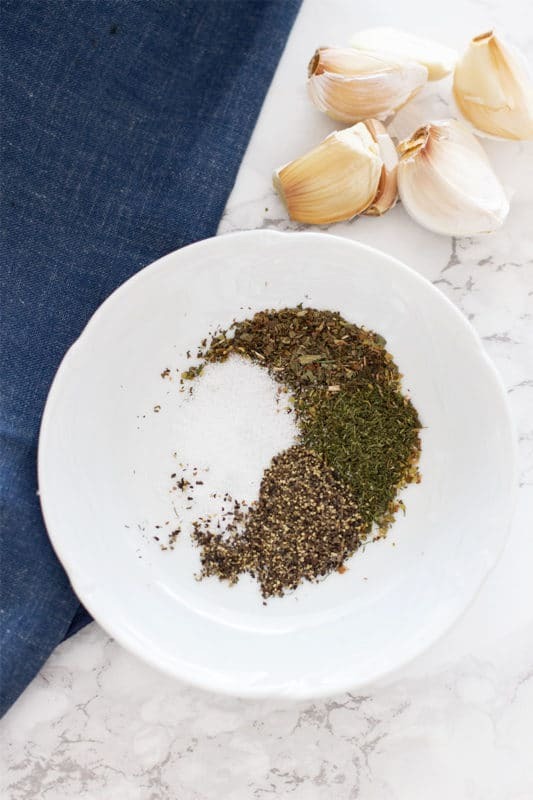 Seasoned with dill, Italian seasoning and Parmesan cheese this smoked potato recipe makes a delicious addition to any meal! Go with me here for a minute because I want to paint you a picture. You’ve decided to break out your smoker and smoke a cut of meat. You’ve cleared your day and you’re going to be monitoring your smoker in preparation for a delicious meal. Your day is planned and your agenda is set. But what are you going to serve with your meal? Have you thought about what side dishes you’re serving with your smoked meat? And are you really going to heat up your house by making side dishes on the stove or in the oven? Queue the Garlic and Herb Smoked Potatoes! Ah…what an amazing smoker recipe! Smoking potatoes is a great way to enjoy your side dish! Let’s talk this one through. Your smoker is already prepped. Your meat is already cooking in the smoker. There is PLENTY of room in that smoker…so why not smoke your side dishes? I mean, it’s a BRILLIANT concept…and super convenient, am I right? And one less mess! For the love of amazing side dishes…guys!!! These smoked potatoes are just the best! 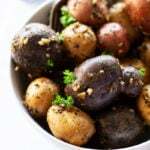 Easy with no hassle, these Garlic and Herb Smoked Potatoes are velvety in texture, zesty in flavor with the fresh garlic, and full of subtle spice with the dried dill, oregano, basil and Italian seasoning. I love love LOVE these Garlic and Herb Smoked Potatoes! And they take literally 5 minutes to prep! Let me walk you through how SIMPLE this process is! 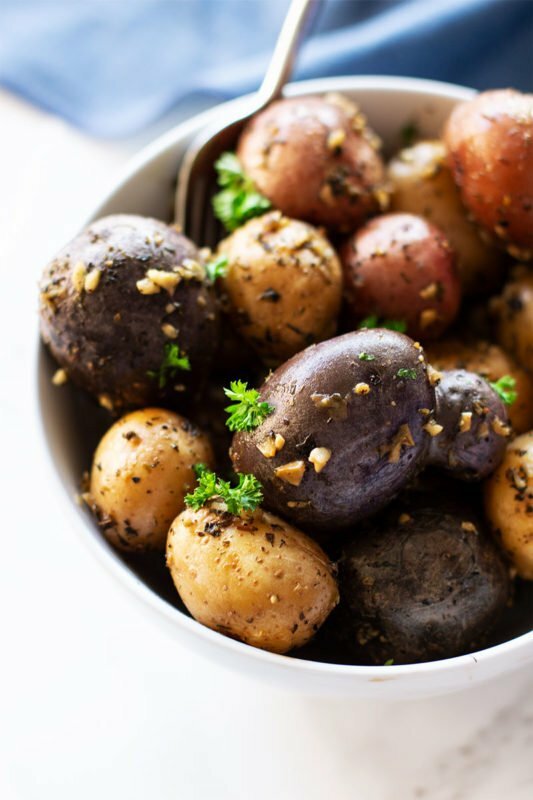 Gemstone potatoes are the BEST potatoes to use for this smoker recipe. 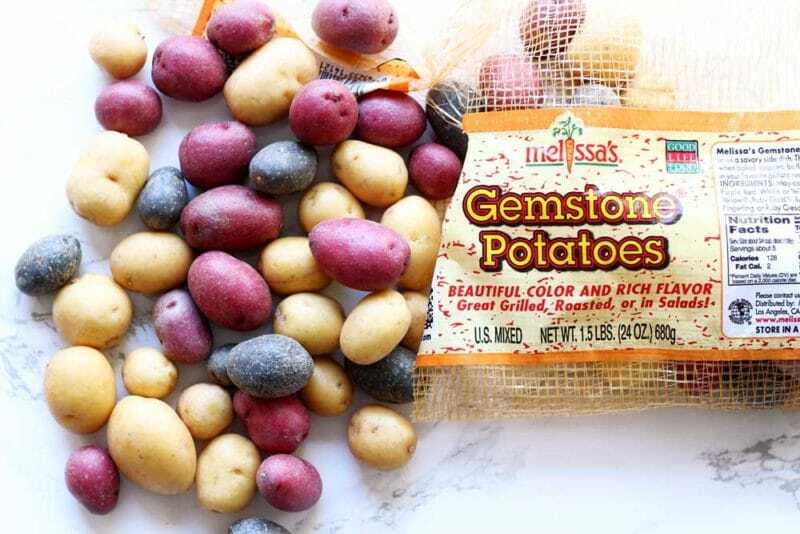 Gemstone Potatoes are a mixture of white, red and purple baby potatoes. They have a thin skin that has the most flavorful and fresh taste. When cooked, they are super velvety and tender. Want the secret to what makes this smoker recipe so phenomenal? GARLIC! Oh my goodness, the garlic! It’s the KEY ingredient. This galic based marinade gives these smoked potatoes the most delicate and nutty flavor! So, here’s how you’ll start. Take all the ingredients and put them in a gallon sized Ziplock bag. After you’ve washed your potatoes, toss them in the Ziplock bag, seal and shake. Make sure that marinade evenly coats all the potatoes. Place the bag in the refrigerator for a minimum of 2 hours. First, I wrap my water bowl with aluminum foil before I add the water. By doing this you’re saving yourself a lot of mess. Less cleanup is always better! Then, I wrap my wood chunks in aluminum foil and poke holes in the aluminum foil with a knife. By poking holes in the smoke pouch it helps the smoke release, which results in more flavor. Preheat the smoker before placing the food in. It takes about 30 minutes to warm up the smoker to 225 degrees. Now, you’re ready to smoke your Garlic and Herb Smoked Potatoes! 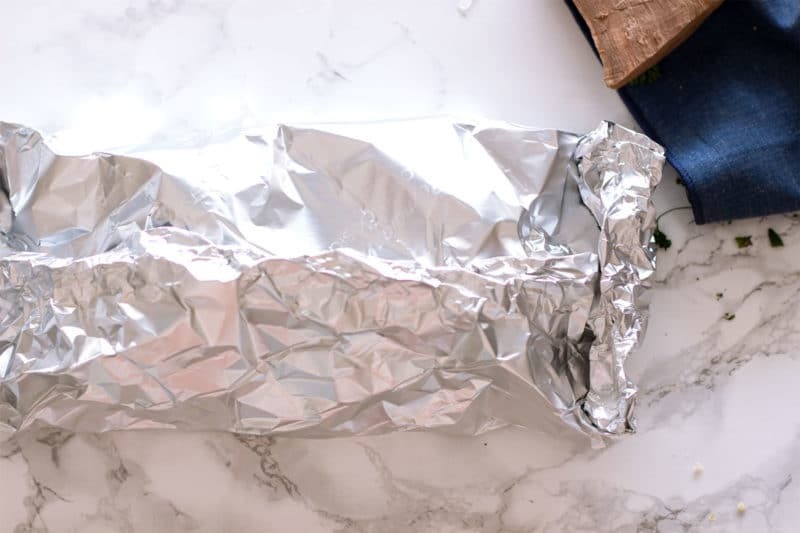 Make your foil packet by folding the aluminum foil in half. Place the smoker potatoes and 2 Tablespoons of water in the center of the aluminum foil and then pull over one side so you can fold the edges to seal. Then, you’re going to fold the remaining edges. Make sure you don’t seal the packet too tightly. You need some air in there! Next, you’re ready to place the foil pocket on the smoker! Low and slow…that’s the secret to smoking food! Let the Garlic and Herb Smoked Potatoes cook in your smoker for 2 hours. 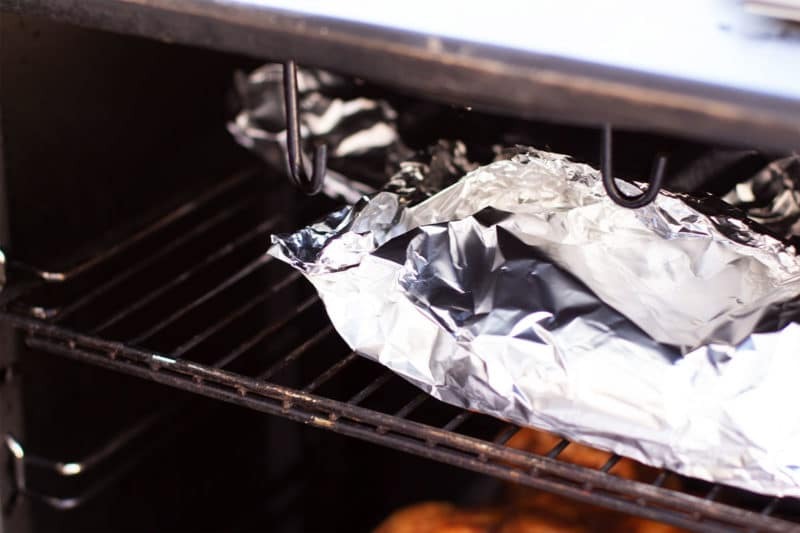 Once done, pull the foil packet from the smoker and slowly open. Pour the smoked potatoes into a bowl and you’re ready to serve! By adding the 2 Tablespoons of water directly into the foil packet, you’re adding direct moisture to the potatoes. This helps the potatoes have more of a velvety texture. After 2 hours in the smoker, take a fork and gently press into a potato to ensure they are done. Top these smoked potatoes with fresh chopped parsley and fresh grated Parmesan cheese! Using a flavored olive oil really helps bring out the flavor in these Garlic and Herb Smoked Potatoes. If you don’t have a flavored olive oil, it’s ok…you can use regular olive oil. Let the potatoes marinate for at least 2 hours…but longer is better! Typically, I let these potatoes marinate overnight, up to 24 hours. These smoked potatoes need companions! Although…I do find myself eating these one…by…one. But if you do want to pair these potatoes with some other amazing smoked foods, here’s some of my favorite smoker recipes I just know you’ll love! So tell me…did you not just LOVE my Garlic and Herb Smoked Potatoes recipe?! If you did I’d love to hear your feedback in the comments below and don’t forget to rate the recipe! Oh…and make sure you FOLLOW ME on Facebook, Twitter, Instagram and Pinterest because I’m CONSTANTLY posting yummy food that I know you will love! Rinse the gemstone potatoes and pour into a large Ziplock gallon bag. Next, chop the fresh garlic cloves and pour into the Ziplock gallon bag. Add the olive oil, oregano, basil, dill, salt, Italian seasoning and ground pepper into the Ziplock bag and seal. Shake the bag so the potatoes are well coated. Place the Ziplock Bag in the refrigerator for at least 2 hours to marinate. After the smoker potatoes have finished marinating, make yourself a foil pocket with aluminum foil. Place the smoker potatoes and 2 Tablespoons of water in the center of the aluminum foil and then fold in half. Pull over one side so you can fold the edges to seal. Then, you’re going to fold the remaining edges. Make sure you don’t seal the packet too tightly. Place foil packet containing you potatoes on a rack in your smoker. Once done, remove the foil packet containing your Garlic and Herb Smoked Potatoes. Slowly open and pour into a bowl. Top with fresh grated Parmesan cheese and chopped parsley. There’s nothing simpler and tastier than roasted potatoes with a lot of garlic and herbs! I’ll be trying this recipe out the next time I have roast beef! Well done! Thanks! You’ll love this recipe! Thanks!! You’ll love the taste! I don’t think I have ever had smoked potatoes. They sound and look awesome!! You should try smoking them….so delish!! I had smoked potatoes at a restaurant and loved them. I am surprised you smoke them in the foil packet, do you still get the smokey flavor I was thinking of just putting them on a vegetable pan? You can put them on a vegetable pan and smoke them, yes. I chose to do the foil pocket because it traps so much more moisture while smoking so those potatoes turn out with a more velvety texture. You will probably get a little more smoke flavor with the vegetable pan, but I wanted that super moist, garlic velvety taste and I knew I’d still get the smoke flavor in the pocket. Let me know how your vegetable pan turns out though!!! Curious about something. Do these potatoes lose all moisture if you’ve just put them out on the smoker grate? It seems odd to wrap something up in foil when you want to add a smokey flavor. I always cook my potatoes in a foil packet for 2 reasons….1. the oil in the marinade and the water help keep these potatoes super moist and that’s what gives them the velvety and moist texture when you bite into them. 2. I poke holes in the foil packet to let the smoke seep into the packet. Typically, I’ve been smoking meat for 3-4 hours so putting my potatoes in the smoker for 2 hours to cook…they are going to take on the smoke flavor. Plus, I add liquid smoke to my water bowl and that helps add more smoky flavor. I hope that helps! This recipe is amazing!! I have made it twice and the first time I marinated for two hours and the flavor was incredible! The second time, I only marinated for 30 minutes and it was still delicious, but definitely recommend the 2 hour time. Follow this recipe exactly and you wont be disappointed! I want to make this for Easter lunch, but a day ahead of time. Any recommendations for this? I would love to smoke them the night before and then possibly reheat them for lunch, has anyone tried this? Thank you! I am SO glad you loved this recipe!! It’s one of my favorites! If you make it a day ahead, the potatoes may be a velvety and moist….but if you try it let me know how it turns out! !